An Anglesey public park's future has been secured after being handed over to the community by the island's council. Holyhead Park was gifted to the town exactly 100 years ago by shipping magnet Sir Richard Thomas and will now be run by the town council. But it has been under threat due to funding cuts. The 4 hectare (10 acre) site boasts bowling greens, tennis courts, mini-golf and play areas. 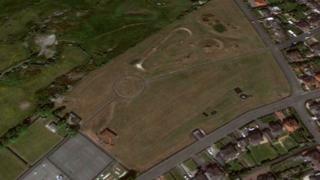 Town mayor Ann Kennedy said the park was "very dear to the hearts of the people of Holyhead". "We are delighted that we have been able to secure the future of the Park for the people of Holyhead now and into the future." The town council said it was hoping to get lottery funding to help run the park, alongside other funding sources. "We have a certain amount of money in reserve, so we can begin the process of regenerating and rejuvenating the area for the people of Holyhead," added the town's mayor. The park is the latest leisure facility on the island to be handed over to the community by Anglesey council, including the Beaumaris centre and Llangefni golf course.